Beautiful engraved specimen warrant certificate from Metromedia, Inc. printed in 1984. This historic document was printed by United States Banknote Company and has an ornate border around it. This item has the printed signatures of the Company's President and Secretary and is over 31 years old. John Werner Kluge (born September 21, 1914) is an entrepreneur who was born in Chemnitz, Germany, best known as a television industry mogul in the United States. He earned his B.A. degree in Economics from Columbia University in 1937. Kluge's major move into media was by purchasing stock in the Metropolitan Broadcasting Company in the mid-1950s. 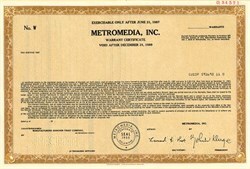 The Metropolitan Broadcasting Company was the successor of the DuMont Television Network, which was spun-off from DuMont Laboratories after the television network ceased operations in 1956. Metropolitan Broadcasting consisted of two stations, WABD in New York City and WTTG in Washington, D.C., both former DuMont outlets now operating as independent stations. Kluge joined the company as its board chairman and largest stockholder in 1958, acquiring the bulk of his shares from founder Allen B. DuMont for about USD $6,000,000. After gaining control, Kluge began the company's expansion further into broadcasting, with holdings in television and radio. In the early 1960s, Kluge bought an outdoor advertising firm, and in 1961 the company's name was changed to Metromedia to reflect the diversity of its interests. In 1986, Kluge sold the Metromedia television stations to the 20th Century Fox film studio, which was now controlled by Rupert Murdoch's News Corporation, for a reported USD $4 billion. Those stations would later form the core of what would become the Fox television network. The following year, Forbes Magazine placed John Kluge at the top of its list as the richest man in America. In celebration of the 200th Anniversary of the Library of Congress, Kluge donated an unprecedented $60 million to create the John W. Kluge Center at the Library of Congress. It was created as an academic center where accomplished senior scholars and junior post-doctoral fellows might gather to make use of the Library's incomparable collections and to interact with members of Congress. In addition, his gift would establish a $1 million dollar prize to be given in recognition of a lifetime of achievement in the human sciences, comparable to the Nobel Prizes in literature and economics. The Kluge Prize would honor lifetime intellectual achievement in the same way as the Kennedy Center Honors recognize lifetime achievement in the performing arts. Acknowledging the scholarship funds that enabled him to attend, Kluge gave more than $110 million to Columbia between 1987 and 1993, primarily to endow financial aid for undergraduates from underprivileged backgrounds. His donations also help many of these students pursue Ph.D.s after they graduate by financing their doctoral studies.